Mark Batty Publisher, 9780984190652, 176pp. The immense popularity of comics and graphic novels cannot be ignored. But in light of the comics boom that has taken place over the past 10 years, the artists, writers and publishers that make up the vibrant African American independent comics community have remained relatively unknown – until now. 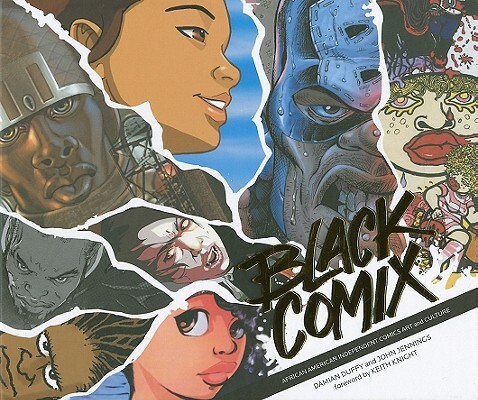 Black Comix brings together an unprecedented collection of largely unheard of, and undeniably masterful, comics art while also framing the work of these men and women in a broader historical and cultural context. With a foreword by Keith Knight and over 50 contributors, including Phonzie Davis, Jan-Michael Franklin, Frances Liddell, Kenjji Marshall, Lance Tooks, Rob Stull, Ashley A. Woods and many, more, the cross section of comics genres represented includes manga, superheroes, humor, history, science fiction and fantasy. This book is a must-have for comics readers.